Historical references indicate that the first inhabitants of Kythnos were the ancient Dryopians whose king was Kythnos, so the island was named after him. Kythnos was also called Dryopis or Ophioussa, while in the Middle Ages it was known as Theramna. From 1143 AD Nileos Doxapatris refers to the island by the name of Thermia, due to the hot springs on the island. Later the Turks called it “Hamam Antaxi” (Thermal Baths Island). Another name was given to the island by the Italians who called it “Fermina“. In the ancient times, a thriving Ionian colony was founded in Kythnos by Kestor and Keylos. The ancient Kithnians were also engaged in shipping and during the Persian wars, they participated with a trireme and a penteconter after having rejected the friendship proposals of the Persian King. The ancient state of Kythnos was well known for its rule of law and for that reason Aristotle devoted a special study on the island to his work called “On State of Kythnos“, a project that was not rescued. In addition, the ancient Kythnians excelled in the letters and the arts, with the painters, Timanthis and Kydis, being the most prominent ones. Due to its geographical location, Kythnos played an important role in the ancient times. The king of Macedonia, Philip the E in 202 BC, mounted a guard so as to stop the Roman attacks. He was successful because when the Romans attempted to occupy Kythnos after the fall of Andros in 199 BC, they were forced to leave the island after a long siege because of the island’s strong fortification. Traces of ancient cities are located in the southwestern part of the island at the site of Rigokastro or Evreokastro and in the northwest at the site Kefalokastro. Kephalocastro was probably the capital of the island that was destroyed by the Turks in the 16th century. Kythnos was also used as a place of exile initially by the Romans. He became best known by a notorious pirate named Nero. During Francocracy (rule of the Franks) from around 1205 AD, the island was under the governance of various Houses such as the Houses of Sanudo, Kastelli and others up until 1537 AD where it was conquered by the Turks. In 1600 AD, the Turks slaughtered all the men on the island, and as result, Kythnos was almost deserted. In the century that followed, its inhabitants were 1,000 to 3,000 with most of them coming from neighboring islands. In 1770 AD, the Russians occupied the island and established a governor – commissioner and four assignees as an administrative authority. 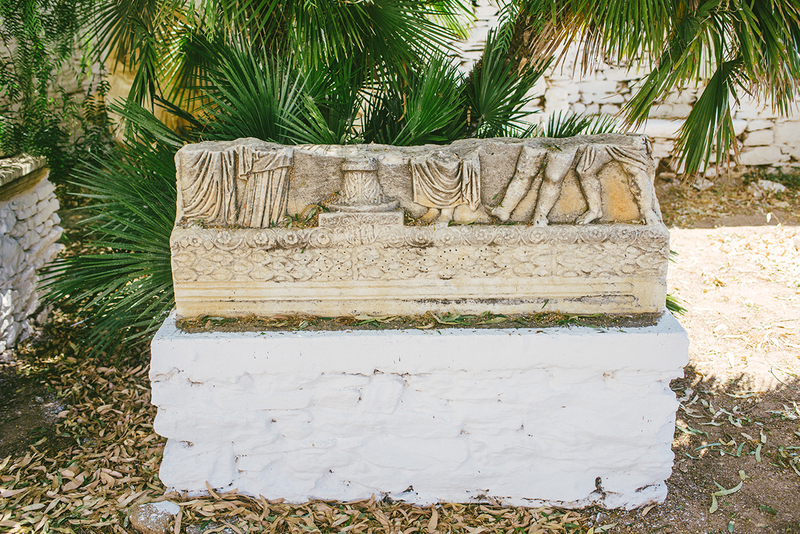 When the Russians abandoned Kythnos after four years of occupation, they took many antiquities with them. 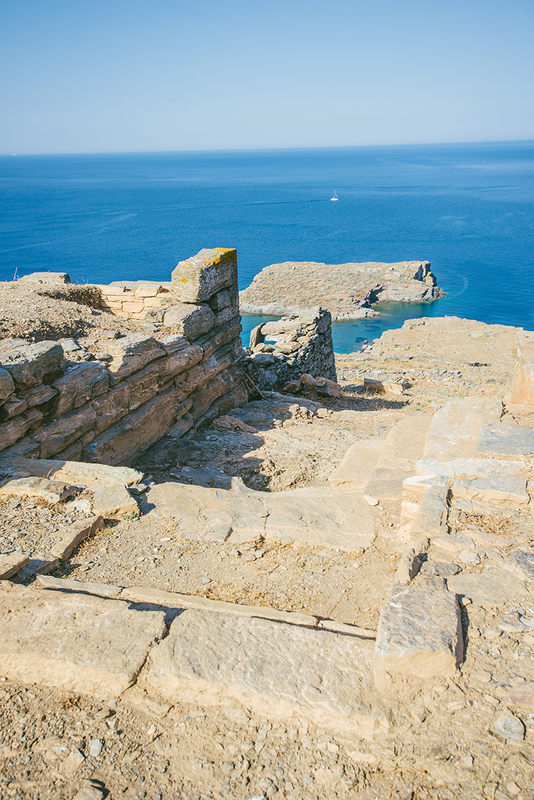 The little island of Kythnos marks an impressive historical presence that covers over 100 centuries of history! Specifically, at Maroula beach, the first traces of humans were discovered in the depths of prehistory, some 10,000 years from today (end of the Mesolithic Age, 8th millennium BC). 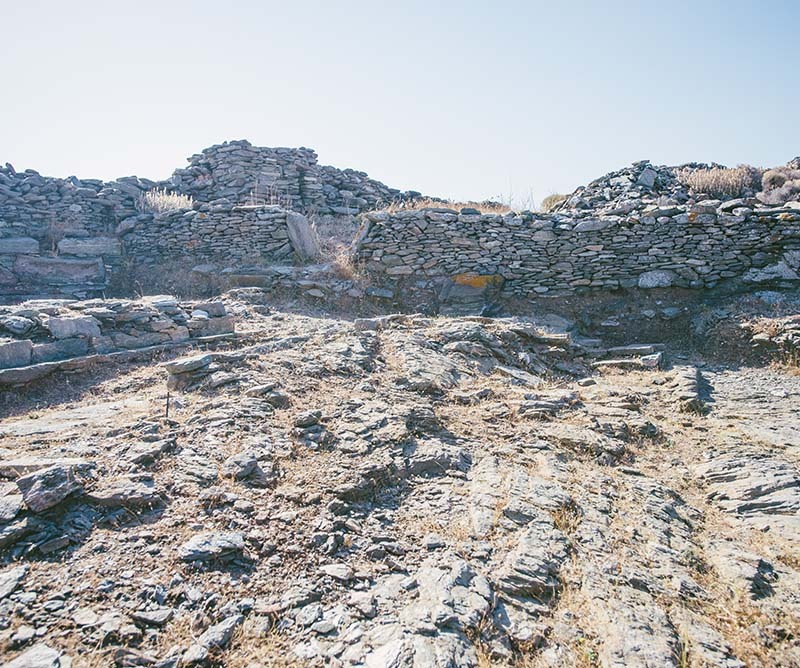 The next documented human activity in Kythnos has been detected in the early Bronze Age (3rd millennium BC), when the copper and mineral-rich island attracted the interest of the copper workers of that time, who set up settlements and installed kilns, something that was repeated nowadays days, with the intensive exploitation of the island’s iron ore. The prehistoric name of Kythnos was Ophoussa, as its dry soil was ideal for sheltering a large number of snakes. The present name of Kythnos is owed to its colonization by the Driopians in the 14th century BC coming from the island of Euboea (Evia) with their leader Kythnos who was supposedly the mythical son of god Apollo. At that time, the interest in Kythnos was mainly nautical and rural, elements that are specific to the island in the following ancient Greek centuries as well, with merchant vessels approaching its harbor (today’s Ovriokastro or Rigokastro), where the densely populated ancient capital of the island was formed, while numerous herds of cattle, sheep and goats were grazing in the countryside. The products of Kythnos, such as wine, honey and mainly cheese, were greatly sought after in the ancient markets. The development of Kythnos and the prosperity of its inhabitants in ancient Greek times are reflected in the archaeological finds of the walls and temples dedicated to Aphrodite, Apollo and Demetra, as well as to the historical recognition of this small island that participated in the Naval Battle of Salamis. Furthermore, in the references of Aristotle, the island is honored for its democratic rule while its governance is characterized as excellent. The Peloponnesian War and the conflicts of Alexander the Great’s successors led to the decline of Kythnos which in the years of the Roman Empire was mainly known as a place of exile. 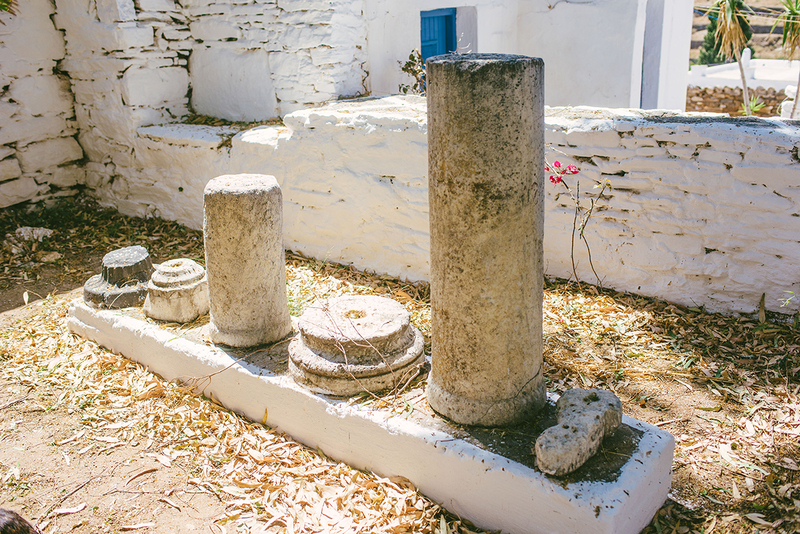 After the prevalence of Christianity and the founding of the Byzantine Empire, Kythnos finds itself belonging to the province of the Aegean Sea. However, the sea barbarian raids destroyed the former capital and the population sought refuge and protection in the impregnable castle of Katakefalos (Castle of Oria), the medieval capital of the island (in the 7th century AD). The occupation of Constantinople by the Franks (1204 AD) brought Kythnos to the share of the Venetians, who were said to have sent to Venice the historical icon of the Virgin of Nikopoios (Virgin of Victory) which had been transferred there from Constantinople and nowadays is worshiped as Madonna Nicopia, at St. Mark’s Cathedral. After the Venetians, Kythnos entered the strong family of the Gozzadini, from the city of Bologna but it was soon occupied and destroyed by the Turkish fleet of Hayreddin Barbarossa (1537). The recent history of Kythnos, after its colonization by fugitives of the Cretan revolutions, settled in the village of Syllakos (today Dryopida), has been marked by the dissident events of 1862, known as the “Kythnian Events” during which revolutionaries against King Otto went to the harbor of Aghia Irini, in Loutra. There, they were trapped by powerful government forces, the movement failed and all three protagonists of the revolt (Leotsakos, Moraitinis and Skarvelis) were executed on the spot.